If you have broken dishes or mismatched pieces of china that you can't bear to part with, turn them into mosaic serving trays, table tops, chair seats or whatever you can imagine. The few pieces of Great-Grandma's china that matches nothing you own but that you can't bear to part with can be made into a beautiful mosaic heirloom to last for many more years. Establish a new family heirloom by picking up stray china plates at flea markets or local yard sales and crafting lovely mosaics from broken dishes. Clean the surface on which you'll create the mosaic very thoroughly. If the surface is covered with fabric or foam, remove it and discard. Cut and peel a piece of contact paper and stick it to the back of a china plate. Place the plate upside down in the paper grocery bag and tap the back lightly using the rubber mallet. Carefully pull the plate out of the bag. The broken plate will be stuck to the contact paper like a puzzle. Remove the pieces from the contact paper. Glue the pieces to the surface you are covering using the household cement. Leave a slight margin between the pieces. Repeat these steps until the surface is covered. Spread the grout over the entire mosaic, pressing it into the spaces between the pieces. Remove the excess grout on the mosaic using a damp sponge. Continue rinsing the sponge and cleaning until the mosaic feels smooth and not grainy. Allow the grout to dry. Wipe and polish the mosaic to remove the film using a dry polishing rag. 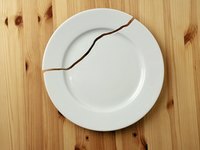 Many different pieces of china will work for a broken dish mosaic, but plates offer a wider, flat surface with fewer curves. Follow the manufacturer's instructions on the grout container for applying and drying time to achieve a successful project. How Can I Re-purpose China Cups & Plates?